Aim Pentose phosphate pathway (PPP) with key enzyme transketolase (TKT), represents a potentially ‘protective’ mechanism in hyperglycaemia. Diabetic kidney disease (DKD), a common complication of both type 1 and type 2 diabetes associated with significant morbidity and mortality, represents the most common cause of chronic kidney disease (CKD). We hypothesized that protective PPP action in diabetes and eventually even more severely in concomitant DKD might be compromised by limited intracellular availability of an active TKT cofactor thiamine diphosphate (TDP). Methods Effect of hyperglycaemia on gene expression and protein levels of key PPP loci was studied in vitro using human cell lines relevant to diabetes (HUVEC and HRGEC) and (together with measurement of TKT activity, plasma thiamine and erythrocyte TDP concentration) in vivo in diabetic vs. non-diabetic subjects with comparable renal function (n=83 in total). Results Hyperglycaemia significantly decreased protein levels of RFC-1, THTR1, THTR2 and TKT (P<0.05) in vitro. 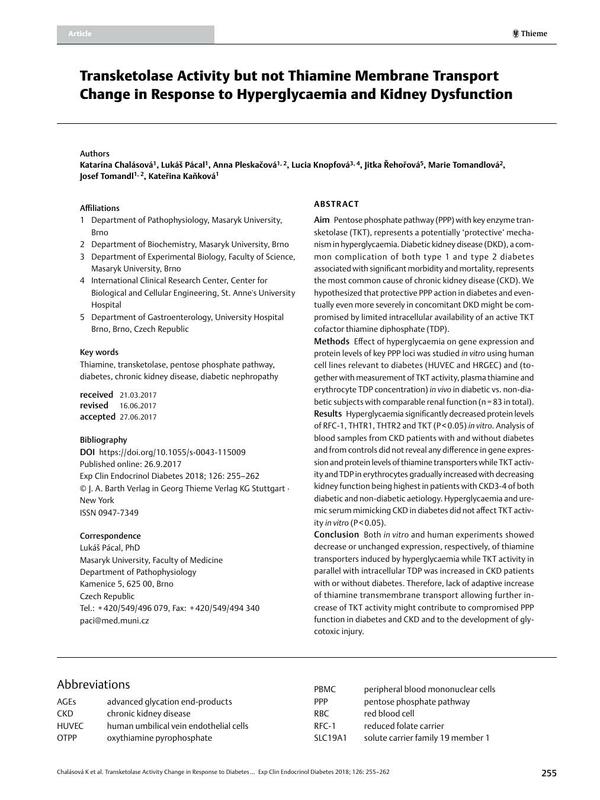 Analysis of blood samples from CKD patients with and without diabetes and from controls did not reveal any difference in gene expression and protein levels of thiamine transporters while TKT activity and TDP in erythrocytes gradually increased with decreasing kidney function being highest in patients with CKD3-4 of both diabetic and non-diabetic aetiology. Hyperglycaemia and uremic serum mimicking CKD in diabetes did not affect TKT activity in vitro (P<0.05). Conclusion Both in vitro and human experiments showed decrease or unchanged expression, respectively, of thiamine transporters induced by hyperglycaemia while TKT activity in parallel with intracellular TDP was increased in CKD patients with or without diabetes. Therefore, lack of adaptive increase of thiamine transmembrane transport allowing further increase of TKT activity might contribute to compromised PPP function in diabetes and CKD and to the development of glycotoxic injury. 2 Stincone A, Prigione A, Cramer T. et al. The return of metabolism: Biochemistry and physiology of the pentose phosphate pathway. Biol Rev Camb Philos Soc 2014; DOI: 10.1111/brv.12140.